Ma Jianzhong was a close adviser to the powerful Qing government official, Li Hong-zhang, and wrote several essays between 1878 and 1890 outlining his plans for economic and administrative reform. He was the first Chinese to advocate the creation of a specialized and professional diplomatic corps. His contribution to the late nineteenth-century Chinese discourse on the state and the economy has hitherto been neglected. 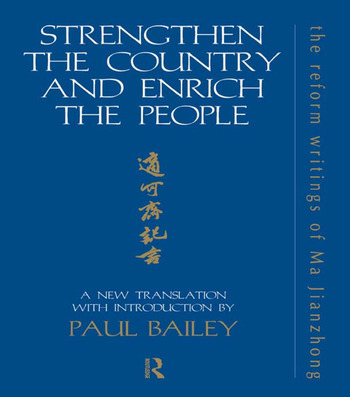 Paul Bailey's translation of his essays will contribute to a wider understanding of the origins and circulation of reform ideas in the late Qing.